Photography By Philip Tulin and Text By Ron Green (subscriber contributor) © All rights reserved. Spectral highlights have been a problem since the beginning of photography. They occur in water, chrome and just about any wet or shiny object. In a controlled studio environment they can be minimized by advanced (soft, or carefully placed) lighting techniques. In controlled outdoor scenic photography (landscapes, architecture etc.) they can be sometimes addressed with polarized filtration. However, in the action-filled world of the wildlife photographer they can cause problems. Using auto-exposure can result in underexposed frames as the camera often misinterprets the highlights for overall brightness rather then point light sources. Digital exposures (particularly at higher ISO ratings) can make the reflections appear worse because the highlights seem to burn out faster (and bigger) than (they would) on film. Add to all of this some "image sharpening" and the highlights begin looking like white spots within black rings. Ultimately there is nothing wrong (or too distracting) with (sun caused) spectral highlights in any outdoor photograph as long as no other white appearing in the frame is of the same (blown out) value. One approach when using Photoshop RGB curves is to keep non-spectral whites below about 240 and let the reflective highlights go to 255. Often you can mask the spectral highlights before sharpening to minimize the black circles. 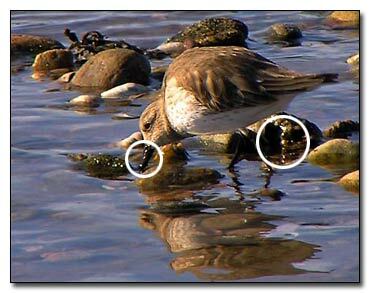 To improve the above photograph, I would leave the highlights on the bird’s beak and reduce the brightness of the distracting and unimportant bright spots on the rocks (particularly that big rock under the bird) using Photoshop tools. After saying all of that, I don’t think spectral highlights are much of a problem unless they seriously detract from the subject.